The Great War between Braxi and Azea has gone on since the beginning of interstellar history, and will continue–some claim–to its end. Unable to achieve final victory, unwilling to accept defeat, both sides have devoted centuries to perfecting their martial capacity, each according to a unique tradition. In the Braxin Holding, the ruling BraxanÃ¡ tribe draws upon ancient customs to create a warrior race as strong as it is ruthless, and utterly without human weakness. In the Azean Empire scientists race to perfect the human genome, and to unleash the psychic potential of the human mind against their implacable opponent. I began working on the background material for this novel in high school. With starmaps tucked into the backs of my notebooks and short stories masquerading as note-taking, I was thus able to spend of my school time focused on something far more important than education: world-building. 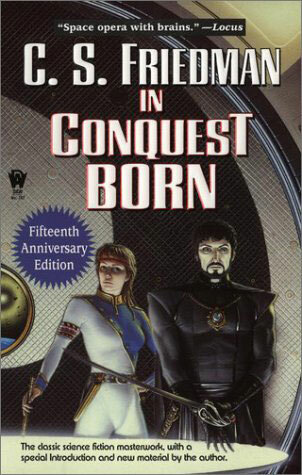 Over time the original concept evolved into something more complex and ambitious, and a collection of interconnected stories began to emerge. In 1978 I was encouraged by a friend “with connections” to develop them into a novel and try to sell it. Alas, I was in grad school by then, which left little free time for writing. 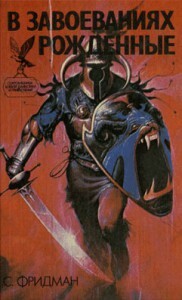 It was not until 1983 that I finally organized the “project from hell” into a novel proper and turned it in to DAW books. They bought it immediately, and the rest, as they say, is history. 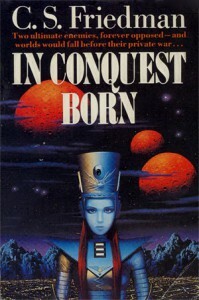 In Conquest Born is, at its heart, a Cold War tragedy: two peoples so long committed to war, so molded by an endless cultural conflict, that “peace” is no longer in their vocabulary. A millenial war punctuated by unstable truces has become the centerpiece of both civilizations, to the detriment of both cultures. Against this background two leaders arise, challenging all that their peoples have become, locked together in a vendetta that borders on sexual obsession. It’s a story that gained in depth and complexity every year I worked on it, and while very little of the material in the completed novel came from those early years — most was written the summer before I turned it in — the characters, the universe, and the underlying themes resonated in a way you can only get when you have spent 12 years polishing your concepts. Don Wollheim accepted the MS for DAW books ‘as is’, declaring he “would not change a word”, but his rapid decline in health meant that his daughter Betsy Wollheim had to take over the business and thus my manuscript. In a scene which I immortalized in the introduction to the Anniversary edition of the novel, she and I bonded over food (better than a contract for New York Jews) and then proceeded to discuss my manuscript. Hesitantly, she broached to me the idea that maybe the story was a bit more fragmented than a novel should be, and maybe I should add a bit more detail to a few spots. I responded by throwing out about 30% of my work and rewriting the whole novel…which she spent the next 15 years feeling guilty about… guilt being yet another important component of New York Jewish relationships. What resulted was an infinitely better novel than my original work could ever have been, which won Betsy a place in my personal pantheon of “Editor-Goddesses”, as well as a permanent card in my rolodex of Best Friends Ever. For the 15th anniversy edition I finally was able to add a much-needed glossary, which I just hadn’t had the time to write the first time around. I WILL NEVER DO THIS AGAIN! Rick, bless his evil soul, had left that page in place when he delivered the package to DAW. And so (I found out a decade later) the first words of mine that Donald Wollheim ever saw was my vow to never write another book. Fortunately for me, no one took it seriously. Fortunately for Rick, I didn’t find out about it until he had moved faaaaaaar away.